Keeping the kids entertained on vacation can often be tricky! Families flock to Gulf Shores, or more aptly named Pleasure Island, a playground of many adventures for the entire family! We’re sharing our ABC’s of kid-friendly activities for tots, teens, and even adults who are still kids at heart. The little ones may think A is for Apple, but in Gulf Shores, A is for Adventure! Set in the Gulf State Park is the 14-acre Gulf Adventure Center, an outdoor adventure along the Gulf Coast. Fly high above the crystal clear waters and white sand dunes on the Hummingbird ziplines, rent a kayak to explore the scenic coastline or paddle board the still waters of Lake Shelby. A unique encounter with nature. In the heart of Orange Beach, Adventure Island has rides and thrills for the whole family. Experience the eruption of a five-story volcano, ride the Go-Karts, bumper boats and paddle boats and set the kids free in the arcade with over 100 games. A fun day of entertainment and excitement! A bird watching paradise winds through more than 50 birding sites along the beautiful coastline. Step into nature and let the kids run free through sandy oak hammocks and swamps as they discover bird life, wildlife and perhaps even an alligator. The Gulf Shores-Orange Beach Loop is closest to town and begins at the bridge over Perdido Pass. If the kids love gators, then a trip to Alligator Alley is a must! The boardwalk is great for spotters of all ages to see gators roaming through the marshes, watch a feeding and meet Captain Crunch, a 13-foot gator who holds the world record for bite strength! See you later, Alligator! The Backcountry Trail weaves its way through the Gulf State Park and is the place to go for hiking or biking. Burn off some energy rock climbing at Boulder Park, picnic in the lush grounds of the bountiful Butterfly Garden and explore the freshwater marshes and coastal hardwood swamps. Local legend says a creature called “The Catman,” half man-half cat, lurks along the paths and swamps of these woodlands. Get sand between your toes as you feed the seagulls, shell hunt and make sand castles. Splash, float or ride the waves in the warm gentle waters with tidal pools perfect for exploring toddlers. Kids love a day playing in the sand and salt water and you’ll find 32 miles of Gulf Shores beaches that are safe for even the youngest waders. Walk the trails, hunt for crabs, picnic under the shade of the pines and oaks or rent a kayak to cast a line. This is an oasis of wilderness and wildlife nestled in between the neighborhoods of Gulf Shores. Take a walk on the wild side! The rustic Bon Secour National Wildlife Refuge spreads over 7,000 acres and is home to nearly 400 species of birds, coyotes, foxes and armadillos! An undisturbed coastal habitat where sea turtles nest from June to October, nature lovers can stroll the raised wooden boardwalk and kids can connect with nature. Keep an eye out for the endangered Alabama Beach Mouse! Kids love crabs! There is nothing quite as exciting on a warm summer night than to grab your flashlight and bucket and head to the sand to hunt for crabs! The perfect opportunity for mom and dad to enjoy a scenic sundowner while the kids and crabs scurry across the sands! We’d recommend heading out to the Gulf State Park Pier. Cross the bridge for a true island experience! Hop on the ferry at Fort Morgan and head to Dauphin island, a quaint small town with uncrowded beaches, excellent fishing and a history worth exploring. First stop is the Estuarium at the Dauphin Island Sea Lab, a hands-on aquarium and great ocean experience for all ages. Step back into the days of the Civil War and surround yourself with history at a living history event at Fort Gaines. On a clear day you may even spot the historic Sand Island Lighthouse with your binoculars! Another great stop for the binoculars is the Audubon Bird Sanctuary, where the kids can explore 137 acres of maritime forest, marshes and dunes with a variety of bird life. Take a cruise in a glass-bottom boat to spot the bottle-nose dolphins - a great way to explore underwater sea life hands on in their natural habitat. There are plenty of charter companies around town for the ultimate dolphin experience. Restaurants and kids don’t often go hand-in-hand as little ones don’t like to sit still! BUT...even eating out in Gulf Shores can be an adventure for kids. There are dozens of kid-tested eateries with outdoor playgrounds, sand pits, ping pong and fire pits. Year-round there are many family-centered events along our coastline. Enjoy finger-licking good food, arts & crafts and live music. Take the kids to pick strawberries or for a ride in a hot air balloon. Check out our Local Events for fun family events during your stay. First, a little history lesson! Gulf Shores was original inhabited by Native Americans who settled here for the superb offshore fishing. Kids can experience the same thrill of reeling in for the first time either from the beach, the fishing pier or on a family-friendly fishing charter! If you’re lucky you may get to take one home for dinner! Head off on a modern day treasure hunt at Gulf State Park, a great spot for geocaching. An adventure for all ages as you go in search of hidden treasure. Step one, sign up at the geocaching website and you’re on your way. The Gulf Coast Exploreum Science Center is a playground for the child’s mind! A little further north in Mobile you’ll enter a world of hands-on exhibits, interactive science labs and play areas. Set your littlest ones free in the Wharf of Wonder and explore the human body at MyBodyWorks! A worthwhile trip for the whole family. There is more to Gulf State Park than calm waters for the kids. Explore the hiking and biking trails, fish at Lake Shelby, tee off for a round of golf or fly through the skies on a zipline. Kids love to play with with Sam, the resident friendly pelican who hangs out on the Fishing Pier. With a restaurant, benches and bathrooms, the fishing pier is a perfect spot to cast a line and wait for the big catch. After a fun beach day, there is no reason to leave! Head for the hippest kid zone in town – The Hangout – for huge juicy burgers and hours of fun for the kids. The giant sand pit, ping pong, bubble machines and foosball tables will keep the kids happy while sun-kissed parents enjoy live music around the fire pit! A hip family hangout on the beach in the heart of Gulf Shores. Explore the world from your chair at the IMAX Theater at the Gulf Coast Exploreum Science Center. The 60-foot domed screen wraps around your kids as they are immersed in the center of action and excitement. Play now, grow up later at over 12,000 square feet of trampolines at The Factory. Launching decks from different heights and famous angled wall trampolines makes this a fun indoor activity for the whole family. Snack on pizza, popcorn and ice cream at the game arcades in town. The perfect solution for a rainy day or a little time away from the sun. Fat Daddy’s will entertain your kids with arcade games and interactive rides. Mom and Dad can step back in time too with a vintage Pacman challenge! A trip to Lulu’s is more of an adventure than a pit-stop for a bite to eat. Lulu’s menu will please even the pickiest little tikes! Clamber around the three-story ropes course at the Mountain of Youth, cool off in the Fountain for Youth, play in the sandpit or grab some ball time at the volleyball nets. Lulu’s has a laid back beach vibe where kids can be kids. And, the Krispy Kreme pudding alone is worth the trip. Take a ride on the Mobile Bay Ferry to Dauphin Island. Known as the “Gulf Coast’s Most Scenic Drive,” the trip offers wonderful views of the historic forts while viewing bird life, sea life and the Sand Island Lighthouse on a clear day. The world’s largest Naval Aviation Museum is worth the journey to Pensacola. Across the street from the historic Pensacola Lighthouse on the grounds of the Naval Air Station, the interactive museum is a worthwhile stop (with free admission). Kids 48” and up can earn their wings on a 2D or 3D Maxflight, take a journey and experience the magic of flight in the giant-screen theater or fly with the Blue Angels in the 4D theater. Be sure to grab a snack at the Cubi Bar Café, where the walls are lined with historic plaques and the menu pays homage to aviation. There is so much to do, you may spend the entire day here! Enjoy playtime at this great little community playground on Wolf Bay with wonderful facilities, picnic tables, views of the bay and picture perfect sunsets from the pier. Take an unforgettable flight as you soar up to 800 feet in the sky for a bird’s eye view of dolphins, sea turtles and sting rays frolicking in the crystal clear waters below. Kids are welcomed if accompanied by an adult! Stroll along the tidal lagoon, board the treasure ship and explore the caves for gold on an awesome adventure golf journey for all ages. Follow the footsteps of Blackbeard for a fun-filled family experience. Dress like a pirate and set aboard a cruise for a non-stop swashbuckling pirate ship adventure on a replica of a period sailing vessel. We all need a little quiet time on vacation – a time to relax, play board games and make special memories with our family in the comfort and privacy of your cozy Gulf Shores vacation home. The thrill of taking to the skies and cruising over the picturesque landscapes of Alabama is unbeatable. Hot air balloon rides offer the thrill of a lifetime! Mother’s Day weekend brings the Hot Air Balloon Festival to town, where the skies light up with floating works of art. A trip to Gulf Shores anytime from May to October is not complete without hunting down sea turtle nests! If you are lucky enough you may see them hatching on the shores. Our shorelines are a safe haven for our endangered sea turtles, so please do not let the little ones disturb their nests. It’s a look, don’t touch experience! Big kids can tackle the High Ropes and the little ones can explore the Sky Tykes course designed perfectly for ages 2-7 at this fun adventure park located at The Wharf. Cruise the obstacle course, zip through the sky on the Sky Rail or keep your feet firmly on the ground with a fun game of mini golf. The fun keeps coming at this old fashioned arcade! Zoot around the three story spiraling Go-Kart track, splash your siblings with the water cannons on the blaster bumper boats, free fall from the skies on the 110-foot Sky Coaster or head to the arcade for a little gaming. Battleship Park is less than an hour from Gulf Shores and is home to the mighty USS Alabama, as well as a World War II submarine and aircraft. Walk the decks, explore the brigs, man the gun turrets and view over 25 war planes in the massive hangar. A unique military attraction worth the trip for enthusiasts of all ages. The award-winning sands of Gulf Shores invite you to an exhilarating game of beach volleyball. Bayou Beach and Romar Beach in the Gulf State Park is a great place to start, so grab the kids and a ball and hit the sands for some action! This is the place kids dream about! A water park that sparks the imagination and offers hours of fun for everyone. You’ll find wild water slides, a giant wave pool, a surf simulator, lazy river and water fountains! There is a separate section for your toddler to cool off and stay safe. In the summer months, Waterville stays open until 10 pm! What a cool, refreshing way to beat the heat. Welcome to Gulf Shore’s ultimate family entertainment district with unlimited shopping, dining and tons of attractions. Catch the unique (and free) Spectra Light Show, ride the tallest Ferris wheel in the southeast for a bird’s eye view of the Intracoastal Waterway, float the lazy river at the Oasis Pools or take a fishing excursion from the Marina. A great place to explore. After all the action, it may be time for your little ones to catch a few zzzzzz’s. Now you know your ABC’s…come stay and play with us. 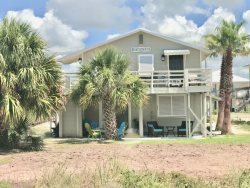 Flip Flop Vacations has the perfect kid-friendly Gulf Shores vacation rental for your whole family to enjoy.